Ring! Ring! Hello. Who’s this? Phil. Phil who? Philodendron. Do I really want my house plants calling me to say they need watering? The Phactor is not overly fond of cell phones (doesn’t have one) and other invasive, pervasive, persuasive, wa-disturbing technologies. The general vegetative state of house plants is one of the reasons plants are never as annoying as cats, who can get your attention at 4 AM (must be breakfast time somewhere) without a cell phone. Cats with cell phones! That's too horrible to contemplate! TP really bums me out! This really bums me out! Old growth forests are being pulped to make cushy soft toilet paper! Talk about squandering of a natural resource! Why this is even stupider than buying water in plastic bottles! So why not use recycled paper for TP, especially since it gets flushed down the crapper any ways? Well, the fiber length gets shorter, so the paper gets a bit coarser and a bit stiffer. For decades makers of TP have waged advertising wars to convince consumers that each has the most squeeze-ably soft TP. And of course strength is an issue. You can’t save trees by reducing the layers or the thickness if it then requires you to “double up”. And there’s lots more research to do too. No one has done a definitive study to determine if crumpling is more efficient use of TP than folding, or if perforations at different intervals, or even absent, reduces or increases use, even if they never tear really well anyways, or if the roll is supposed to feed over the top or from underneath. OK that last one has actually been decided by our feline TP attendant who requires an over the top feed for him to do his job efficiently. In the Phactor’s many travels around the tropics, he’s encountered lots of “inferior” TPs, and they all get the job done. So does a bucket of water and a towel (You were carrying one? ), once you get the technique of it, and then you begin to understand the prohibition of eating or touching someone with your left hand. Bottom line, cotton cloudy softy cushy bummy wipes are not a product anyone needs. Of course none of us can remember when last year’s Sears & Roebuck’s mail order catalog got recycled in the house out back. So the idea of cutting down old growth trees for TP because the longer fibers feel softer on your bum gives you a good idea of what’s wrong with American consumerism. Their job is to sell TP not save the environment or use resources wisely. So it is up to the consumer to watch the real bottom line. The next time you see a clear cut section of coniferous forest, you’ll know what to think. How charmin’. The Phactor noticed this ludicrously colorful fruit display this m orning on the tree outside his building. What a wonderful presentation this fruit display makes! Looks like something from a Georgia O'Keefe painting. Do you recognize this common genus in fruit? This fruit is from the bigleafed magnolia (Magnolia macrophylla). The pendent, cone-like fruit is a lurid pink and consists of fruitlets, one from each pistil, in the form of a one or two-seeded follicle (like a milkweed pod). When the fruitlet splits open the seeds dangle forth on a thread and are covered by a fleshy pink-orange aril, a reward for the bird dispersers. The actual seed is black and has a hard shiny seed coat. This time of year a flock of grosbeaks or cedar waxwings will find this tree and an hour later every single seed will be gone. Here in Lincolnland we live in the midst of the maize and soybean desert, so some side affects can be expected. Presently gazillions of aphids have descended upon us and their swarms shimmer annoyingly in the evening rays of sun as autumn advances. Swarms of aphids are so thick you can hardly breath, and please, do not ask a bicyclist to smile. Spider webs are filled with little tidbits, and the swordtails in my fountain pond are feasting upon thousands of aphids. These are not just any aphids, but soybean aphids, and this winged stage is seeking a tree upon which to mate and lay eggs for over wintering. But they are not just seeking any tree, but a buckthorn (Rhamnus), not exactly a common tree. One of my colleagues tracked down a buckthorn yesterday and its leaves were a mass of aphids, so there is precious little room at the inn for all those gazillions still looking. This massive population built up during favorable summer weather (cool, wet) will crash. But here's the amazing thing about such insects. The offspring of those few aphids (in comparison to the whole population) will disperse next spring seeking soybeans, and if favorable conditions prevail, their ability to reproduce could again produce such massive populations. If soybean aphids pose an agricultural problem, then perhaps buckthorn eradication will be proposed to break their life cycle, just as currants and gooseberries were eradicated to break the life cycle of white pine blister rust. In the meantime, these aphids are attracted to yellow and light green, so dress accordingly. There was a distinct flavor of fall in the air this morning, and that’s how life in general is beginning to taste as I begin counting down my 7th decade. The Phactor wasn’t so sure how he felt about this, although it helps improve the attitude to have a new, authentic Hawaiian shirt, but while lots of things remind me about getting old, the spirit of a 20-something is still in me at times, but it just can’t ignore the aging package or the accumulated common sense and do stupid things anymore, and that is probably just as well because you can still enjoy living without doing stupid things even though the very young do not believe this. You come to understand that when you grow up, and up, and up. This somewhat morose feeling that old age is creeping up on me gave way to the pleasantry of the morning as the sun began to slice through the mist and tree leaves on my stroll to the coffee shop and then to my office, and the knowledge that this most certainly will be a beautiful September day as so many of them are. So it is good to be alive in September when good apples begin to ripen, and it just isn’t worth making a pie before they are; now if I could only remember where my apples were? How sad this morning to read of Mary Travers death. This news started the sound of Mary singing Leaving on a jet plane in my head and it has been running all morning. The music of this trio was part of the peace loving side of the sixties, a gentle counterpart to the cold war, struggles with racial justice, and a pointless war in Vietnam. Their first LP album (monophonic!) was purchased with my hard-earned lawn-mowing money. It still sounds pretty good though a bit worse for wear, and so in that sense does the Phactor. The greatest joy of wildish gardens and grounds comes from those unexpected visits from unexpected guests. As it turns out Mrs. Phactor is quite observant and has discovered several such visitors, and now what may well turn out to be a new resident, even though its presence is quite a puzzlement. The funny little plant growing in the leafy litter under the Douglas fir turned out to be an orchid, Spiranthes cernua, nodding lady’s tresses. These are fairly tough little (6-8" tall) late summer and fall flowering orchids, and considered fairly easy to grow. A similar species, slender lady’s tresses, grows on the Phactor’s prairie study site. The genus name comes from the spiral organization of the flowers on the inflorescence (spiro- spiral, anthes – flowers). So how did it get to our garden in a city’s center? Orchids have absolutely minute seeds, dust seeds, and plants with such tiny seeds usually make large numbers of them. 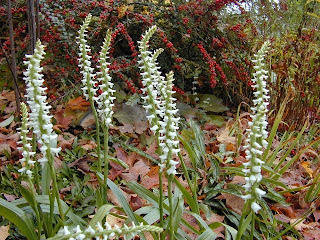 Other species of lady’s tresses are known to produce 2000-3000 seeds per tiny fruit and you can judge from the number of flowers how many fruits there may be. Wind dispersal can deposit such seeds a long ways from their origin, and most will lose the land-in-a-good-place lottery. Fortunately for us, a seed found its way to our bit of nature. Now if the stinking rodents stay away, our new resident will enjoy a long and hopefully productive life. Image from Seneca Hills Perennials. For a delightful leak, and it's yours for just over $7000! Well, the Phactor cannot top that for a line. 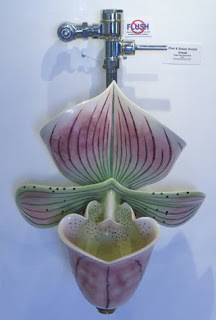 So for the (male) flower fancier who has everything, here's the finest example of anatomically correct bathroom fixtures. Now, let's consider how this is pollinated. More at the Human Flower Project. We all must wait in great anticipation for their line of toilets, sinks, and bathtubs. With respect to food, does fresh mean anything any more? Even air is fresh, and if it isn't we have air freshener! Are the 2 week old eggs in my fridge fresh? Are those mangos "fresh from Mexico?" Clearly refrigeration and more rapid transportation have changed the meaning of fresh. It used to be simple, if you took the egg out of the nest that morning and picked a mango from its tree on the way to the house, they were fresh. Beans out of the garden are fresh; beans at the store are not. Mangos from Mexico are not fresh, but if being a localvore (spelling? or is it locovore?) means not having mangos every now and again here in Lincolnland, then count me out. And then there are somethings that absolutely must be fresh like sweet corn. My Father wouldn't even pick it unless the water were already boiling. The new stay-sweet varieties allow even local farm producers prolong "fresh" and it still troubles me deeply to pick up a "fresh" ear at the local farm stand and feel how cold it is. Why fresh is as bad now as "home-made". There was a time when home-made meant cooking or making something from scratch. But for all too many people it means taking it out of the box, stirring in water, baking it, and calling it "fresh, home-made cake". The mix had only been in the cupboard for a couple of months, and before then in the store, and then in some warehouse. So let's just ban fresh unless followed by the word "picked" meaning about 20 minutes ago. In terms of sustainability, David Barash, a psychologist at U. Washington, argues that we're all Bernard Madoffs. Ecologically "you simply cannot keep moving and growing and developing and mining your capital, assuming infinitely available resources and a natural environment of such unfailing elasticity that it will swallow our effluent forever and continue to provide a steady supply of resources into the bargain." And it's true. Yes, old Malthus was right, and yet an economist at our university expressed surprise that biologists still believed in Malthus because he'd been so thoroughly disproven. And that may be part of the problem, economists don't want to deal with ecoogical reality. A story circulated a few years ago about an interdisciplinary conference on energy, and after one of the economists got done speaking, a physicist said, "that won't work because it violates the laws of physics." And the economist said, "Well, who knows what the laws of physics will be in 50 years." But it will be a challenge to live sustainably because our economic system has been built on exploitation of resources and people. Let the Phactor know what you think. As summer here in Lincolnland slides into September and as the Cubs sink out of sight, it's time to do some garden evaluation. 1. The decision to save and transplant storm damaged Japanese maple is a clear winner. The now one-sided tree looks great in its new location and the cool, wet summer took the risk out of the transplanting. 2. Tomatoes. Wow! Blight and weather resulted in worst year in my decades of gardening history including the year in tropical Australia when the Phactor planted tomatoes on the sunny side of his apartment in the spring (August) only to realize the sunny side would become the shady side when the sun shifted back north and sunny shifted to the opposite side, a lesson on life in the tropical zone. 3. Squash. In spite of missing the critical period for controlling squash stem borers, the season was good for zucchini and fair for winter squash. Dwarf orange hubbards look worth planting again. Discovered a quick zucchini pickle recipe that can transform a pound of zucchini into the best sweet-sour pickles ever (to be shared in an upcoming post). 4. Wedding veil and netting. Clear winners! Japanese beetle destruction of apple tree foliage was essentially eliminated. First time in years for green beans without beetle nibblings, although inside their rodent exclusion fence (another winner) and under the veil, the beans looked like inmates. 5. Asparagus. Grew like crazy and produced the largest aerial shoots ever which portends good things for next year's crop. Some things liked the cool, wet summer. 6. Peppers. Not great, not awful, but Melrose, a reliable producer here in Lincolnland had one of its worst years. 7. Eggplant (Asian varieties). Doubled the number of plants and still didn't get enough. Combination of weather and flea beetles (too small to control with netting) made for a meager crop. 8. Raspberries. Canes rebounded and produced a much larger crop than predicted. Blueberries produced so few none actually made it out of the garden, but the snacks were appreciated. 9. Spring greens. Excellent year for salads aided by early cold frame start and transplanting of lettuce seedlings. Late season crop is planted, but a little late to be certain of good production. Typical enough scoreboard. In small gardens you never bat one thousand. What were winners & losers for my readers?